I came home from my daughter's house last Friday with several new tasks for myself. She was out of Swiffer refillable spray for cleaning her floors. This presented me with a challenge. You see I have told my family that as they start running out of cleaning supplies do not replace the cleaning product. The challenge is to see if I can make it myself, and to make it all natural and safe for the environment. This is especially important for my daughter, because she has an auto immune disorder which chemicals and certain foods cause flareups. We normally buy green cleaning products, which are very expensive. In these difficult financial times, I am trying to make as much as possible to help save money for all of us. That is why I will try my best to only give recipes for natural beauty products and cleaning supplies on this blog. Now, we have all wood floors in our home, and we are only supposed to use vinegar and water on the floors, but that is not as great at cleaning the linoleum at my daughter's. I also wanted to try to kick up the anti-bacterial and disinfecting qualities, because our family is very big on pets, so I wanted to make sure the the floors were getting as clean as possible. So, at this point I decided that I was going to use some Dr. Bonner's Baby-Mild Castille Soap, Tea Tree oil, and Lemon Essential oil. I figured that would be great for her linoleum floors, but I did not want to use the soap for our wood floors. I decided to make the wood floor cleaner without the Dr. Bonner's, but still wanted to kick up the disinfecting qualities with the tea tree oil and the lemon essential oil. I mixed up several batches of the wood floor cleaner, and it worked great. I put it in a small quart sized bottle with a small mouth, that way I could pour small amounts. I did not want to soak my wood floors. This worked great. Since it is concentrated I could just pour a small amount on the floor, mop, and then go and rinse the mop. My floors looked beautiful. I also made a batch for my son, and put it in an old squirt bottle. For my daughter, I mixed up a batch of this recipe for Homemade Swiffer Cleaner Spray, and I put it in a spray bottle. That way she could just spray it on her floor, and then use her Swiffer to mop it up. This apparently worked great on her floor. So TAH-DAH, here are the two recipes. Mix all ingredients together in a spray bottle and spray on floor and use your mop or swiffer to clean, rinse the mop and move on to the next area. Mix all ingredients together in a container and pour on floor and mop as usual. This was so easy to make and use. I did not need to use a lot, since it is pretty concentrated. I maybe used about 1/2 cup on my first floor, and mopped about 900 square feet, so it goes a long way. It also left a great citrusy ( probably not a word according to my spell checker ) smell, which I like much better then the smell of the plain vinegar and water mixture. I hope that these DIY solutions work for you. I would love to hear from you. I am always open to suggestions or a better idea. So let me know what you think and how it works for you. Thank you. It is so easy. I appreciate your input. I also loved your sunscreen recipe. I am featuring in my featured links on Friday. I'll send a link to you once I post it. Thanks for visiting. I hope that you like the way it works. 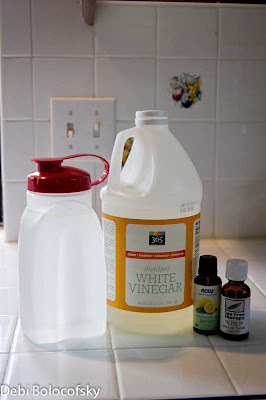 I have an auto immune disease as well and use vinegar to clean alot of things. This is awesome! I'll be trying this. Thanks! I'm so happy that this is something that you can use. My Charly loves it and uses it all of the time. Have a great week and thanks for stopping by. Just wanted to tell you that they sell a mop that's sort of like the swiffer wet jet but more customizable ...it has interchangeable spray bottles that attach it to and washable microfiber pads. I've been using bona hardwood cleaner but I think I will try your recipe! I will need to have Charly look into that. I just use a regular mop, but Charly is tied to a swiffer type mop. Thanks so much for the info. This is a great idea. I have seen that before, but have not tried it yet. I will have to try that next. Thanks so much. Wow!!!! Thanks so much, I am definitely going to try this! I would like to know more about the customisable mop, one of the commentators posted about. I have hashimotos, and I'm trying to weed out the harmful chemicals in my house. I really enjoying being chemical free in our home. I also like the fact that I can make my own cleaning supplies with household products that I have around already. I hope you like this also. I buy them at either Vitamin Cottage or Whole Foods. You can also order them online, or get them from you local health food store. Thanks for the great ideas. I put just a touch of Dawn in a bucket with hot water and a cup or two of vinegar to clean my floors. Vinegar is so amazing for cleaning. I use it straight in a spray bottle with just about a teaspoon of Dawn and some lime essential oil as a daily after shower spray. Wow that is a great idea for shower spray. I will have to try that. Thanks for sharing. you can reuse your Swiffer bottles, all you need to do is heat some water in a microwave container, remove from microwave and then put the top part of the Swiffer bottle into the hot water for a minute or two then remove wipe off with towel then pull off with your hand, fill with cleaner and then as it cools back down the lid will be tight fitting again, and when it gets empty once more you do the same thing again. or just buy an O Ceder mop with a built in cleaner bottle for your own cleaning mix, and washable head pad. Thanks so much for letting me know about the swiffer bottle. I didn't know it could just pop off. Hi Michelle. I would use the Swiffer Floor cleaner recipe. It would be better for a laminate floor. It is also good for tile. The other recipe is better for hardwood flooring.